The Forest development corporation Pakistan has invited applications from individuals who are interested in joining the department and build a successful professional career. For this purpose, the candidates will have to attend a test under the supervision of National Testing Service (NTS) and only those candidates will be eligible to move further in the selection process who will pass the test. The test is going to take place on 26th January 2014, so make sure you prepare well for the it otherwise you will loose a great employment opportunity. To help our visitors in this case, below we have given a number of NTS test sample model papers that can be downloaded through just one click and they will certainly gonna help you in preparing well for the exam. 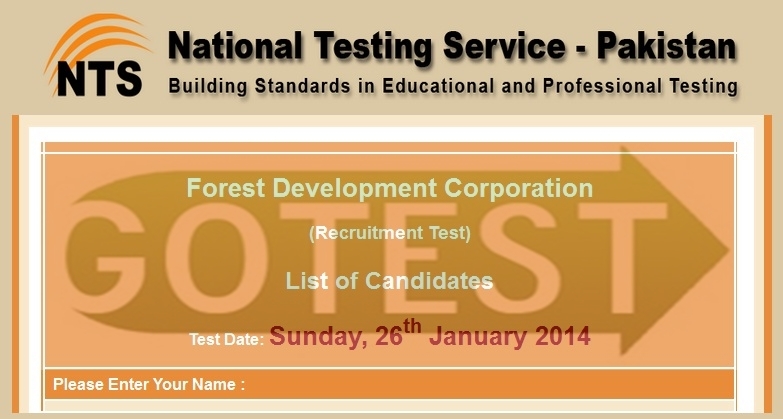 Along with this, after the completion of the recruitment test, the candidates will also be able to check their Forest Development Corporation recruitment NTS test result online here from this page without any trouble.